BORDEAUX BLACK, BLACK/RED, PREMIUM CLOTH SEAT TRIM, [Z66] ACTIVATION DISCLAIMER, [L92] CARPETED FLOORMATS & CARGO MAT, Wheels: 17" Machine-Finished Aluminum-Alloy, Variable Intermittent Wipers, Valet Function, Urethane Gear Shift Knob, Trip Computer, Transmission: Xtronic CVT -inc: manual shift mode and D-step simulated gearing. 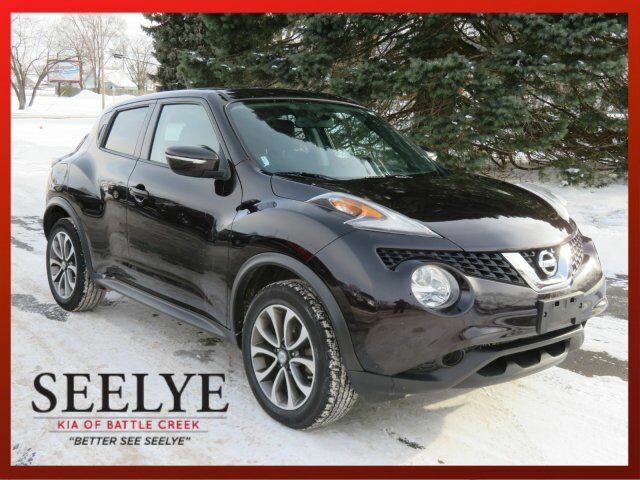 This Nissan JUKE has a powerful Intercooled Turbo Premium Unleaded I-4 1.6 L/99 engine powering this Variable transmission. Transmission w/Driver Selectable Mode, Torsion Beam Rear Suspension w/Coil Springs, Tires: P215/55R17 AS, Tailgate/Rear Door Lock Included w/Power Door Locks, Strut Front Suspension w/Coil Springs, Steel Spare Wheel, Single Stainless Steel Exhaust, Side Impact Beams, Seats w/Cloth Back Material, Remote Releases -Inc: Mechanical Fuel, Remote Keyless Entry w/Integrated Key Transmitter, Illuminated Entry, Illuminated Ignition Switch and Panic Button, RearView Monitor Back-Up Camera, Rear Cupholder, Rear Child Safety Locks, Radio: AM/FM/CD/Aux-In Audio System -inc: 5" color display, USB connection port for iPod interface and other compatible devices, Bluetooth hands-free phone system, streaming audio via Bluetooth, hands-free text messaging assistance, Siri eyes free, and SiriusXM satellite radio, Radio w/Seek-Scan, MP3 Player, Clock, Speed Compensated Volume Control, Steering Wheel Controls and Radio Data System, Proximity Key For Doors And Push Button Start, Premium Cloth Seat Trim, Power Rear Windows, Power Door Locks w/Autolock Feature.